From Easter egg hunts to gift baskets filled with little toys and goodies, Easter is filled to the brim with tradition. It's full of fun but also full of waste and generally unhealthy practices like dying our eggs in toxic chemicals, throwing away dozens of plastic eggs in the trash... and binging on candy coated chocolate robin's eggs (mmmm..... I'm so guilty). What can we do to change this? How can we make our Easters a little healthier? A little more earth-friendly? ► Buy Local Free-Range Eggs & Produce. Support a local farmer by buying their fresh eggs and veggies. Small farmers are more likely to grow organic produce and raise their chickens free from tiny cages and crazy growth hormones. Visit your local farmer's market and ask the seller if their goods are organic. Ditch the weird chemicals and dye your eggs in natural dyes you can make yourself from fruits, veggies and various plants. Check out "Dyeing Eggs Naturally" by Martha Stewart for a great tutorial. If you're not much of a DIYer, you can buy all-natural egg dye kits HERE . Consider using something that can be used again and again long after the toys and goodies are gone; like tote bags , backpacks, lunch boxes , and even larger toys . Buy candies and other Easter treats from eco-friendly brands and companies that use wholesome, natural ingredients and environmentally friendly packaging. Check out Amazon's huge selection of organic candy HERE . ► Do not buy "Easter Pets"
Do NOT buy baby chickens, rabbits or other live animals as Easter gifts if you're not one-hundred percent sure you or your child can commit to caring for them. Animals are NOT toys. They are living beings that need lots of love and attention. Visit a kid-friendly farm instead or buy your child a cute eco-friendly stuffed animal like THESE over at Wild Dill. Cook your meals with local organic food and as tempting as it may be, try your best to not use disposable dishes and napkins. If you do find yourself entertaining a huge amount of guests for Easter dinner, there are earth-friendly brands to consider; you can find them HERE . your neighbor bought, and all the people in your neighborhood, your city, your state, your country, the world! And what do we do with them when we're done? Toss them. That's a lot of dang plastic that's going to in the trash every year. Reuse plastic eggs for future egg hunts and events and check out this great article, "36 Ways to Upcycle Your Easter Eggs". Support small, eco friendly businesses by purchasing clothes and gifts from them for Easter. Not only are you supporting the business that sells the items, but you're supporting the artisans that create the goods as well. Many of these artisans live in less fortunate countries and are paid fair wages for their time and effort. This is called "fair trade". The money they make from selling their goods to larger companies can often be enough to not only support their families, but their villages and communities as well. 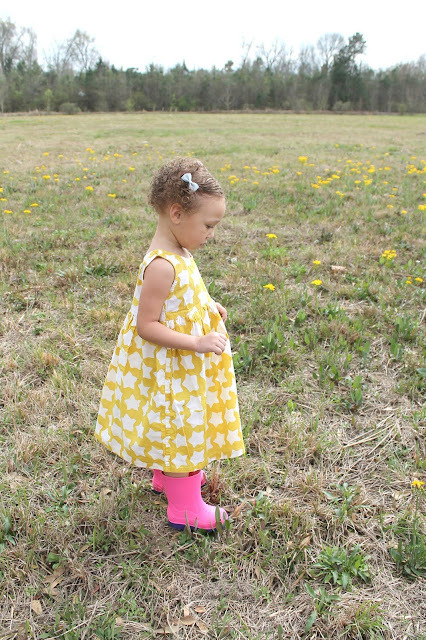 In the photos featured in this post, my two-year-old daughter Cedar is wearing a gorgeous dress made from hand batiked fabric. 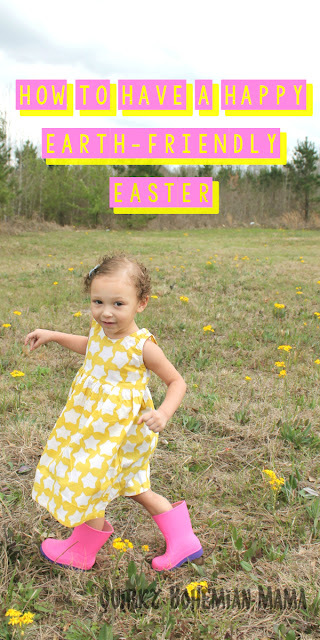 The dress is fair trade and was made in Ghana by Global Mamas and sold by Wild Dill. The tag of the dress was signed by woman who made it! How do you "green up" your Easter? Tell me all about it in a comment below! This is the best post I have ever read about practical ways to celebrate an Eco Friendly Easter. Thank you for sharing such great ideas at the #HomeMattersParty - we hope you will link up with us again on Friday! I reuse the plastic eggs over again.